VPN Unlimited was founded in 2013 and is located in the US (New York). Not the best jurisdiction for a VPN provider. But are they really fast? And can they really bypass Netflix geo-restrictions and keep you secure on a public Wi-Fi? In this in-depth VPN Unlimited review, I’ll do some research and give you detailed look at their cons and pros, as well as whether I recommend using this VPN or not. Ever since 2016, Netflix has been putting a stop to any user accessing their website via a VPN or proxy. According to our research, roughly 70% of VPNs manage to bypass this block. Luckily, VPN Unlimited is no exception to this rule. 2 servers out of 4 worked. So they’re not lying. That’s a good start. As I have stated time and time again, most VPN providers are kinda bad when it comes to customer service. Much to my surprise and amazement, VPN Unlimited is not one of them. While it is true that they do not offer a live chat feature like many of the more premium VPN providers, the quality of their email/ticket support is unparalleled. I submitted a simple query on their website (asking whether or not their services would protect me from someone monitoring network activity directly from the router) around 6:48 p.m. my time. Since some time had passed since I last reviewed their customer service (which used to be terrible by the way), I just wanted to gauge the speed and efficacy of their support team to see if anything had improved. I was pleasantly surprised when, only 20 minutes later, I opened my inbox to find a helpful and polite response from one of their representatives. When you compare the customer support of VPN Unlimited to some of the other VPNs on the market (for example VPNs like CyberGhost and IPVanish), the quality and speed of their service are actually quite remarkable. While it might not stand up to ExpressVPN’s live chat feature, the support offered by VPN Unlimited is a breath of fresh air in a market plagued with shoddy customer service. VPN Unlimited encrypts your information with something called the Advanced Encryption Standard or AES. This super secure encryption standard is the same one used by federal agencies to transmit sensitive data and it is, quite literally, the most secure symmetrical encryption standard in existence (at least that we know of). It’s true that most VPN providers already use AES-256 to encrypt your data, but since security is one of the primary concerns when selecting a new service, this still counts as a “Pro” in my book. If you peruse the list of different VPNs that we have reviewed, you will undoubtedly notice that most (if not all) of them offer the above VPN tunneling protocols. So why in the world would I list this as a “Pro” for VPN Unlimited? Because of one special little extension. KeepSolid Wise is a special extension to the OpenVPN tunneling protocol that makes it difficult (nigh on impossible) to detect. Think of it as your proverbial cloak of invisibility. In countries with oppressive and outdated censorship laws, government officials will often search for individuals using VPNs to bypass their Draconian regulations. As soon as they find one of these connections, they will throttle your performance and impede (or completely stop) your browsing session. 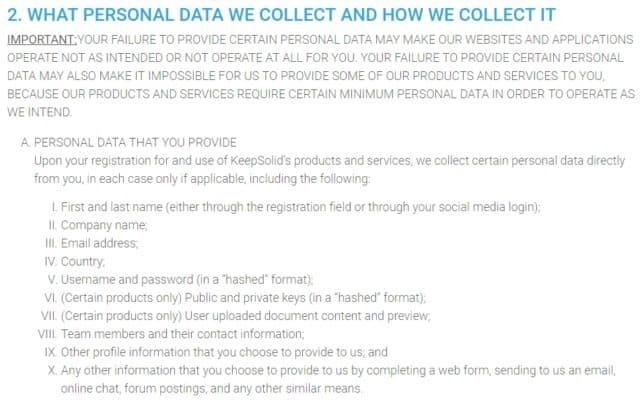 However, with KeepSolid Wise, you can slip through these nets and make your traffic appear just like any other standard connection. And while this is a huge bonus for VPN Unlimited customers, unfortunately, it is not a bonus for all customers. They also extensions for both Chrome and Firefox as well as compatibility with any Windows phone. Update: Since January 2018, they have also included built-in kill-switch feature to their app. The interface on VPN Unlimited is incredibly easy to use. After launching their software you are only one click away from anonymous browsing, and their simple sidebar allows you to quickly find exactly what you are looking for. While some of the more advanced users might find their overly simplistic interface to be a turn-off, for most customers, this easy to use dashboard will provide everything that you need and more. Whenever you were a kid, you probably heard the statement “If it’s too good to be true, then it probably is”. Well, that was true during your childhood and it’s true today. After hearing about their lifetime pricing plan, many of you are probably chomping at the bit to get started with VPN Unlimited’s services, and I don’t blame you. Unfortunately, their promise to provide Secure, fast, and easy access to any site online, has yet to be fulfilled. While VPN unlimited is far from the slowest VPN that I have ever seen, they rank 50th out of 78 (well below average) and their server (which they have 400+, locations in 70 countries) are much slower than NordVPN’s which is a better and cheaper alternative. As always, you should take these tests with a grain of salt since they can vary wildly and are dependent on a number of uncontrollable variables. That being said, however, I have scoured the internet for other tests and even went so far as to ask some of my colleagues to test the speeds on their network and all of them reported similarly disappointing results. While these aren’t the worst download or upload speeds that I have ever seen, if speed is of the essence for your VPN-related endeavors, then you should probably check out some of our other VPN reviews to find a provider that can offer the performance you are looking for. 2. They Possibly Keep Some Logs? It’s a common practice for free VPN services to log your personal information and then sell it to advertisers and marketers to pay for the services that you are using. However, most high-quality VPNs guarantee zero logging of your information or activity. Unfortunately, VPN Unlimited is not one of them. For starters, VPN Unlimited monitors how many people are trying to access their servers in order to maintain security and help customers troubleshoot network problems. They also track the different clicks that you make inside of their software in order to optimize their interface and ensure the best customer experience possible. Again, seems harmless to me. If you are someone with real security concerns, this suspiciously vague intrusion should raise a few red flags but, in my experience, shouldn’t be cause for any real concern. While VPN Unlimited’s logging activities are (apparently) innocuous, I prefer a VPN with a strict “Zero Logging” policy. And, in the spirit of total transparency, I want to ensure that every potential VPN Unlimited customer is aware of how the company tracks and stores your personal data. While this isn’t necessarily a deal breaker, VPN Unlimited certainly isn’t getting any points for their logging practices. If you live in a country that enjoys the freedom of speech and do not plan on traveling anytime soon, then you’re likely in the market for a VPN for one of two reasons. Unfortunately, VPN Unlimited isn’t much use for potential customers who fall into the second category. While I have no doubt that this stance has earned the approval anti-piracy advocates worldwide, it has also alienated VPN Unlimited from a huge market segment. If you need a VPN provider with torrenting capabilities, VPN Unlimited is probably not right for you. I know that this is a pretty minor bone to pick, but I couldn’t resist. With so many VPNs on the market that allow you to secure your browsing experience only a few minutes after making your purchase, I was disappointed to find that VPN Unlimited requires you to restart your device in order to get started with their services. This isn’t exactly a deal breaker, but considering some of the other problems with this VPN, I was hoping for a more seamless user experience. The last time I reviewed VPN Unlimited, they offered more than 7 different pricing plans ranging from $2 for 7 days, all the way up to two years of service for around $50. However, the times have changed and the team in New York decided to consolidate their plans into a more traditional set of pricing packages (with one exception). They offer one month, one-year, and three-year pricing options (all of which are budget friendly) which is pretty standard fare for a VPN provider. But where things get interesting is when you look at their unheard of lifetime pricing plan which, as the name implies, means unlimited VPN access… Forever. Here’s how it all breaks down. At $9.99, VPN Unlimited isn’t breaking into any new territory when it comes to VPN pricing. This is a pretty standard rate that can be expected across the board. Unlike most providers, VPN Unlimited doesn’t have any middle ground between their one month and twelve-month packages. If you want to buy a VPN for short-term travel purposes (i.e. a 3-month business trip abroad), then you will probably want to shop around a little bit more to find a company with a plan that is more tailored to your needs. All plans do allow for 5 simultaneous connections. That being said, at only $5.00 a month, VPN Unlimited’s yearly plan is definitely budget friendly, but as you might now, NordVPN – $2.99/mo (highly recommended in our review) and Private Internet Access is even cheaper. If this plan is making you scratch your head and mutter “Meh?” under your breath, you are not alone. VPN Unlimited is (literally) the only company that I know of to offer a lifetime plan to their customers. Not to mention that all things considered, this plan is pretty darn cheap. Only time will tell if this business move is genius or ludicrous, so until then, let’s suffice it to say that if you plan on using a VPN for the foreseeable future, this might be the cheapest option in existence (unless, of course, you are willing to settle for a sub-par free service). VPN Unlimited also offers a 7-day money back guarantee on all of their plans so if you do make a purchase and then decide that they aren’t the VPN you are looking for, you can easily get your money refunded. All the major payments options are available, such as Credit Card, PayPal and Bitcoin for anonymous payments. It’s also worth mentioning that once you’re signed up, you have “auto-renew” ON. Unless you plan to keep using them, it’s worth turning it OFF. Do I recommend VPN Unlimited? No, I do not recommend this VPN service. I went into the review process with high hopes. There are too many much better VPNs on the market (at a similar or even cheaper price) to settle on a service that provides such limited capabilities and slow performance. Overall, you’d be better off with either NordVPN (rated #1) or Surfshark (rated #2) in our VPN reviews. P.S. Have you ever used VPN Unlimited before? If so, what was your experience like? I’m always interested to hear your experience (good or bad). I got a lifetime subscription for $32 for 5 devices which I think is great, worst case I will wait a year or 2 and look for something else and this will pay by itself. I am only interested in connecting my HTPC and so far I have had no issues with youtube or Netflix so it may not be the fastest VPN around but for this specific case it is good enough. For my first VPN it's all that I need. They have torrent specific servers, but if you have and use other p2p software it'll probably work just fine on any other server. Being from Canada, I was pleasantly surprised to see that their Netflix servers do work for accessing American Netflix as this isn't originally what I got a VPN for (which is torrenting). I'm able to game with the VPN going with additional 20ms on my connection, which isn't something I notice at all. It's imperceptible imo. I have never had any issues with servers disconnecting on me. Fortunately I don't have a need for their stealth protocols, but it's nice to know I have them, but they do, indeed, keep your DL/UL speed stable. Works great on iOS, it's just a lil hard on battery drain. My only real concern is I have to switch to a torrent specific server if I want to torrent. Appalling Failure of a non-functional Product! I had VPN Unlimited up and running on my laptop - the app said I was "connected." 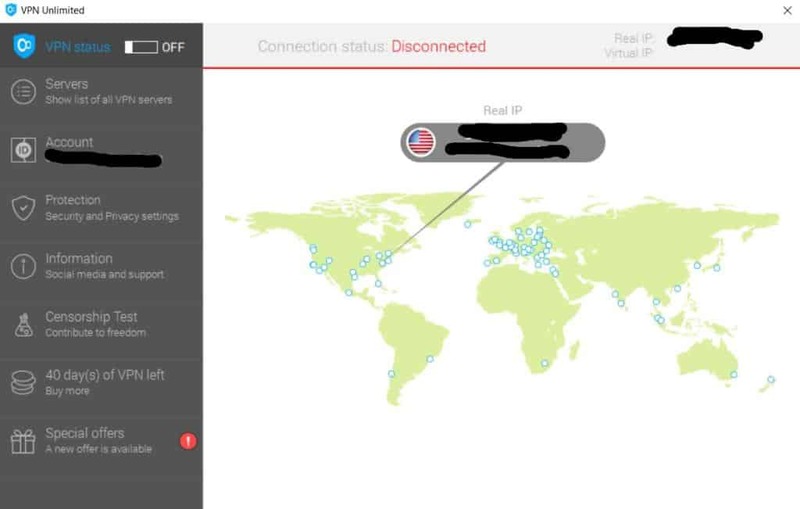 A few minutes later I was on another VPN's website, where, as a demo, they showed IP address and location. Guess what? The IP address they showed was mine, and the address was also accurate! Their service not only wasn't working, it was falsely telling me it was. I then used a free version of Proton VPN, revisited the same web site, and it showed a different IP and location. How many times have I been compromised by this POS app? TERRIBLE! They take your money after you cancel a subscription and never refund it! The VPN never worked. I cancelled the subscription at the start of 2018. Only to find out they'd been billing me every month until I had to physically go into my PayPal and cancel it - no mention on this on their website at all and because I'm dyslexic I misread the payment details as being from the new VPN provider I set up. I mean, you think you cancel the account and it says no more billing on their own website means the payments stop, right? Complaints to PayPal and KeepSolid have yielded nothing, aside from 'because it's been seven days we can't refund you further' despite it being their error. Next stop is my credit card provider. Do not use this company. The VPN was terrible and complicated to figure out, and watch your bank account too. Not the fastest...but the lifetime subscription is still a great deal. I stumbled upon this article because I googled the program name to download a new install for a new laptop I got. It seems like a pretty fair assessment of the company. However, I then saw all the 1/10 reviews and I figured I should at least say that my experience has not been bad with this company. Like the author, I have also had very good response times and experience with their customer service. I am disappointed to know that their logging policy is not as strict as many other services out there. However, I don't do anything that I wouldn't want to be caught doing online (ie. torrenting), so it is not a huge deal for me. Also, I travel a lot and the program works well on my iPad (at least the latest version does) and on my Windows laptop. It automatically connects when I log onto a network that is not recognized/listed as a "Trusted Network." Every time that I've checked to make sure that I'm on their network, I find that I am protected. The "Trusted Network" feature also implies that you can make your home network a trusted network and VPN Unlimited will not require a connection for your internet to work when you are logged onto your home router. This might be a solution for some people with speed issues; but then you have your ISP logging everything you're doing (thus defeating the purpose of having VPN if you are using it to shield yourself from your ISP spying on you). But is it so horrible that I can't get consistent, reliable use out of it when roaming on public networks? Absolutely not. I think I paid $119.95 for their lifetime subscription, and that has saved me not only the money that I would be paying for other services but the time that might be spent switching back and forth between the other ones to see which one is "best" -- something much better left to people who get paid to do that sort of thing. Casual use for last two years. I mostly use VPN unlimited for torrenting. Got lifetime unlimited plan 50% off from Cracked shop (~$70 instead of $150). It's fast enough for me. For ex: 1 gb file typically downloads in 6 to 8 minutes and scales linearly. Only problem I've had has been using on my uni network. I signed up for VPN unlimited about 1.5 years ago after getting an email from my ISP about torrenting. I found a good deal I think $49.99 for life. I know this is an amazing and unsustainable price but I figured if it lasts 2 years it will pay for itself. When I initially got it it would say it was connected but not be sending my traffic though the VPN. Customer support was helpful and said the issue was with IPv6 and using IPv4 would fix the problem. While this is not ideal it did work almost flawlessly after that. When I signed up many servers were near 100% loaded and performance was about half my normal speed. However server load now is quite low and speed is quick. No matter what happens now I've already got my money's worth so it has been a good purchase. I've been using this service for over a year - got the Lifetime for 39.99 - and I adore it. The speed on any of my devices isn't significantly reduced when I use a low traffic server... I've occasionally gotten protocol errors like others describe, but I just choose a different server and then it works (so I'm not really sure why others would complain about the problem so vehemently). I have an account with ten device slots, so right now a friend of mine in china and a friend in prague both use my account to access US versions of websites (including Netflix, and with no issues...). Frankly, it's easy to use, the speed drop is negligible and the peace of mind of having a service that I never have to renew is wonderful. I've tested other VPN services (thank God for free trials!) and while I haven't had any issues with them, either, they can't really beat the Lifetime price point. I have just started using it on my Mac and it seems just fine as far as performance. I am getting 170Mbps down and 30Mbps up (which seems adequate) and ping times are only slightly higher (this is from a server in Canada to my system in the mid Atlantic USA). I am downloading (and uploading) a torrent as I type without issues. I was able to install it from remote without any need to restart (must be a Windows thing). I will know more later when I try it on my mobile devices, but for now the only reason it's not getting 100/100 is the vague logging policy. This VPN messed up my Mac, is very slow and worst of all, after you've tried it for just a few days, when you ask for a refund, Stack Commerce that manages VPNU's billing tells you it won't give refunds. It took me four emails and another attempt via chat to get in touch with them. Stay very far away from this miserable operation. Added this service for a discounted price about 1.5 years ago and initially worked ok.
Should work a lot better and faster. And every time I use my phone I have to re-initialize their app otherwise other apps just sit there and spin/won’t open. By their admission, they monitor content and filter it. While they “may” limit torrenting, the bigger issue is that they admit that their scanning traffic and potentially applying their own judgement and rules to whether they’ll allow it or not. Go with a solution that is committed to a free and open connection without them intruding or scanning your content. Do not trust on Keepsolid , this is the second time they tried to charge on my credit card without my permission, emails never replied, I will contact Amex to block you for good. I have been using it for a couple of months. Got it for $19 for lifetime subscription. My issue with them so far is the constant protocol errors. Half the time it is useless no matter what. I tried two different computers. Support has no idea. Maybe because I have a slow 2M speed (the cheapest I can afford). VPN Unlimited works great for my situation, which is occasional video or sports watching in other countries, especially the UK. I am based in the USA. No problem with speed including live sports in Europe. Look for a special deal from Stack Social – they often offer lifetime subscriptions at a very low price. After installation, be sure to restart your PC. I bought the lifetime package for 50 bucks on sale since I thought it was worth the chance. So far I’d give it a 2 out of 5 since it sometimes works, and it could be worse. But the neftlix specific IP, designed for one purpose as the name suggests, is very often blocked. Worse, when U contact support (all Russians) they respond with such unhelpful advice such as “make sure you are connected to the correct server.” and “use a different browser”. I’m still in the market for a quality VPN, this shows a ‘lifetime’ bundle for $39.99 with a pop-up for 10% off of 1st purchase, of which I accepted. However, before pulling the trigger, Googled VPN Unlimited Reviews, this was among the first. It worked great, at first. This program is becoming a bad deal. I get notices that there are problems and it won’t start, it then takes up to 3-4 times restarting the computer before it will even try to connect, and then can take 30-45 minutes before I can use the Internet. I bought the VPN unlimited license but it doesn’t work consistently. It will work for a few minutes then it will go down. Then I switch to a different server and it may log into it or it may not. If it does it might work for about 5 minutes then go down again. Today they sent an update and now it doesn’t work at all. Don’t mess with this piece of junk. It’s not worth it and it will just waste your money. I’ve been using VPN unlimited for several months and it generally works fairly well for me at home, though I’ve run into a number of sites that will not allow a connection if the VPN is active. More annoying, when I’m out at a coffee shop, library, etc., more and more frequently, VPN unlimited “connects” but sits forever in it’s “Virtual server loading…” state, never assigning a virtual IP address. In that state, I can’t get to any site, sometimes the DNS resolution of the site’s IP address cannot even be done. It’s becoming less and less clear to me that it’s worth the monthly fee. Have been using VPN Unlimited for a year (unlimited for $39). Works well. I have a 50 Mbps IP, and that is slowed to about 40 Mbps when using the VPN. Does have some servers that allow torrents. Has servers all over the world. Works on Mac and iOS devices. No problems. I have been a subscriber to VPN Unlimited since April 04, 2015 where I paid $39.00 for the VPN Unlimited: Lifetime Subscription. I moved to VPN Unlimited from PIA (Private Internet Access) and have not looked back. There were some speed issues initially, but those seem to be resolved. The customer service, as you share, is excellent and the response time refreshingly surprising. VPN Unlimited also allows P2P or BitTorrent. I think your speed metrics should have been demonstrated as no VPN speed and a with VPN “X” on to illustrate the differences. In the past you could not stream Netflix, but you can now if you select the correct server. I use a Mac and I do not recall having to restart my computer to use the app, but that may have been the case and IMHO, that is a trivial issue. BTW, really, you counted that as a reason? I did need to purchase additional connections for the family, but that one-time charge is better than additional monthly fees to add another service. I am a “little” concerned with the logging issue, which is what keeps this from getting 100%. Clear, clean, and easy-to-use interface, excellent connection speeds, and terrific customer support make up an excellent VPN service. Side note: they have a Netflix server option now that I test regularly with satisfaction from Colombia. They also added a BBC server option that works. Their logs politics is shady, they are based in USA, they don’t allow torrenting and you have to pay for that, it’s ridiculous. I started using their service 2 Months ago and tried many sever but all of them extremely slow not exceed 500 KBITS/S !!! I started using their service 2 years a go when I stumbled upon a ‘lifetime-deal’ for VPN unlimited. I didn’t think much of it and fully expected them not to honor the lifetime part at all. But still to this day I use their service almost daily. VPN Unlimited has Desktop and Mobile apps, which both never gave me any trouble or errors. They have VPNs in almost every country of the world which you can ALL use. They specifiy which ones you can use to torrent. The speed is OK, all VPNs slow down your original internet speed and theirs is just like that. The only downside for me with VPN Unlimited is that I couldn’t easily find how to configure my OpenVPN settings with their service, which I actually still don’t know how to do. It should be possible though. Doesn't Work For Days At A Time. Extremely Frustrating. Purchased a 3 year package for what I thought was a bargain. VPN client won’t connect for days at a time. Cust service says reinstall & disable firewall. Even then it doesn’t work. Eventually (12 hours-3 days later) it will start working miraculously. Absolutely worthless if you need a VPN every day. I have used VPN Unlimited for a couple of months now, I use it for gaming on my xbox so I could get to use US servers, in certain games the ping is reasonable with some with very little to no lag like RN6. I rent my own server and so the download speeds aren’t bad since the server is in LA and I’m in Bangkok, Thailand around 8,000 something miles. The price is 20 dollars and I think its a bit high but its the best speed so far for me. The support takes sometime to respond which I would love to have a live chat but I’ll make do. I’ve been using VPN unlimited for about 4 years now, it is easy to configure with the app but if you want to use it without it you can but it is somehow hard to get the info, you can select up to 4 devices to connect, right now I have a lifetime account, so that means that it won’t cost a dime in the future, all thanks to the promotions they usually do. The support team really works fast you could get your issue solved in a couple of minutes, the only thing that I don’t like is the cautions about using the service (i used it with an Asus router) and they were really clear that you need to know what you are doing with it. Fast and cheap, but buggy. VPN unlimited has some serious issues with its security system which allowed me to use it for free for almost 6 months. Overall the app is well designed and reasonably fast, my speed changes from 100mb/s without it to about 80 with it. But I live in London so results may vary. There were some bugs leading app to error messages but only a couple times in 6 months. Out of 7 vpn apps I used, this one gives the best speed for the cheapest price. I tried it and first it wouldn’t connect so they made some suggestions and on the last day of the free trial it worked. I asked and they gave another 7 days trial given it didn’t work through no fault of mine. After a couple of days I lost the ability to connect to the net with notices coming up saying there was no internet connection. I didn’t know that they had the connection but all it did was prevent me from getting on the net and I was left stranded. I had to reset my computer back to an earlier date to get rid of it in the hope that it would fix the problem. It did. Have you any idea how that could happen? Also the download speed, when it was working, was no different to my regular download speed. In the UK they would be prosecuted under the Trades Descriptions Act which is contravened when selling something to the public and not delivering what it says on the label. Unless the fault was with me. I don’t want to pay a ton of money for a simple software like VPN. Hence the reason I’m using VPN Unlimited. YES, they aren’t that speedy, but that’s not an issue for me as I’m only using them to watch Netflix and it truly does the trick. Many VPN’s out there are good like ExpressVPN and VyprVPN, but their plans are expensive. I discovered VPN Unlimited through their ads. Their logging policy and encryptions were good, kinda slow unlike the two others but for a price half of the two VPN’s were mentioned, VPN Unlimited is showing potential to VPN business. VPN Unlimited has been my favourite provider for a while. I’ve also tried out VPNArea, TorGuard. VPN Unlimited stands out with their effective customer support and fast servers. In my opinion, they’re incredibly fast + they have a huge variety of different servers across the globe.